Aquarium plants can make your fish tank look more vibrant and interesting. They can also make the aquarium more like the indigenous environment of the fish which will make the fish less stressed and healthier. Maintaining live aquarium plants poses can pose new problems for Aquarists. This article will discuss some of the things you need to consider to keep plants in your fish tank. Plants need Carbon Dioxide to grow. Carbon dioxide (CO2) is the most important nutrient that you need to keep aquarium plants healthy. CO2 is produced by the waste products within the fish tank, like fish excrement, excess food and as a by-product of bacterial action but this is often not sufficient to keep plants in good condition. Therefore many people utilize a system that puts CO2 into the aquarium. CO2 systems come in a variety of shapes and sizes but can be split into two simple types. Those that provide a constant source of CO2 and those that can regulate the CO2. It is a good idea to regulate the CO2 either using the system or manually because fish will suffer if there is too much CO2 in the water. Rough guides for carbon dioxide suggest that 30 to 45 mg per liter of water is enough for plants to thrive but over 100mg per liter is too much for fish. Plants need an adequate lighting source. Plants need a good substrate. A substrate is the type of gravel or sand that you use in the fish tank. The substrate must be deep enough to allow the roots of plants to take hold and keep the plant firmly attached. You want the substrate to have a depth of about 8 cm. Substrates can also be nutrient rich so they can help to keep the plants healthy but they must not alter the quality of the water. For example, lime based substrates will make the water harder or more alkaline. Most fish have a preference for soft or hard water if the water was to change due to the substrate the fish could become stressed or ill. Many Aquarists use layers of a substrate to get around this problem. If a fish likes soft water then the top layer of the substrate would be a lime-free gravel. Under the lime-free gravel, a liner layer of nutrient-rich gravel could be used. Carbon dioxide, a good light source and a nutrient rich substrate are important components in maintaining live aquarium plants. Liquid fertilizers can also be used if you feel that the plants look in poor condition. 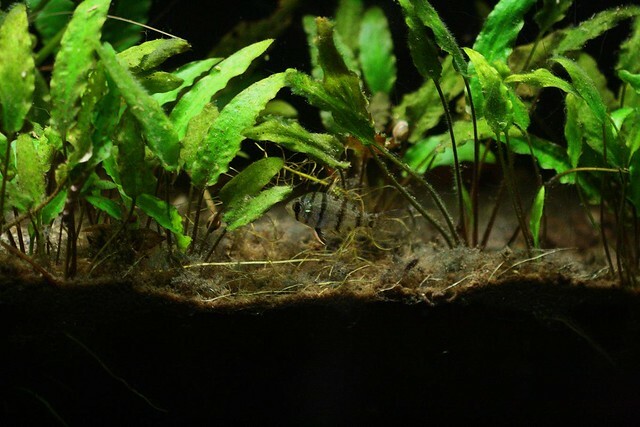 Plants play an important role in aquarium life. They help to absorb nitrites that are toxic to the fish. In fact there are some plant only aquariums. There are many different varieties of aquatic plants. Tubers are a type of plant that needs to be anchored by the root to the bottom of the tank. They may be tied or simply buried underneath the substrate in the bottom of the aquarium. There are also floating plants. As their name suggests they simply float in the tank they do not need to be anchored and will not usually require fertilizer. The only regular care required is to make sure that water droplets are not regularly deposited on the leaves, as this will cause decay. Water lettuce and Lily pads are examples of floating plants. Rooted plants, like tubers need to be anchored to the bottom of the tank. It is suggested that the roots be tied to pieces of rock or wood. These species usually grow to be fairly tall and will add length to an aquarium. When planting these, remember to allow plenty of room for growth. The roots will grow outwards and require additional space. Another type of aquatic plant is known as cuttings. These plants may be transplanted from other thriving plants, without have to root them. Cuttings should be planted individually. They will grow vertically and sprout shoots at the joints of the leaves. When these shoots grow to be a couple of inches, it is time to cut them and plant them individually. Live plants may be kept in aquariums alone or with fish. The plants may even be used as a food source for some species of omnivorous fish. At the very least, they will provide shelter and a feeling of refuge for the fish. All plants require some form of light in order to thrive through photosynthesis. Check the specifics on the types of plants with your local retailer. Some plants will thrive on the waste put out by the fish in the aquarium, while others will require regular fertilization. Again check with your supplier for compatibility and feeding requirements. When purchasing plants, make sure that they are true aquatic plants. Live plants should be pruned weekly. Dead or broken leaves should be removed daily. A live plant aquarium will require the same basic equipment needed for an aquarium containing fish. The basics are as follows. You will need a tank, some sort of filtration system, lighting and some basic cleaning tools. The plants are fairly easy to care for, but you do have to keep up with your regular maintenance. Synthetic plants may be a good alternative to live plants, if you are not willing to make the investment in live plants. Faux plants have come a long way in recent years. So much so, that your fish may not even notice the difference. Whether you choose live or synthetic plants, they will add interest and life to any aquarium.